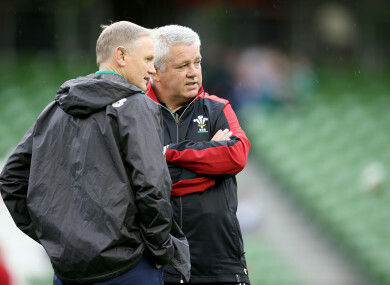 File photoe: Gatland in conversation with Joe Schmidt at the Aviva Stadium. WARREN GATLAND BELIEVES “European powerhouses” Leinster and the fine Heineken Champions Cup performances from all of Ireland’s provinces give the men in green a Six Nations edge. Joe Schmidt’s defending Grand Slam champions are odds-on with every bookmaker to retain their title in the 2019 tournament which starts on February 1. Ireland head coach Schmidt has seen Leinster, Munster and Ulster all reach the Champions Cup’s knock-out stages. By contrast, Wales boss Gatland saw all four Welsh regions fail to escape their pool both in the Champions Cup and the second-tier Challenge Cup. “I’m a bit wary of where Wales are going to go in the future and what is going to happen,” Gatland said. “We need the regions to be successful by competing in the Guinness PRO14 and in Europe. “There’s no doubt Ireland are benefitting from the way their provinces are performing at the moment, certainly Leinster as they are a European powerhouse. “Wales need the regions to be doing that as it makes it so much easier for the national team to perform. It is frustrating at times to watch some of the performances and then with the regions not being successful, it’s about how do you change that and make a successful national team. Wales haven’t won the Six Nations title since 2013 and this year’s championship will be Gatland’s last in charge. Last week the former Ireland coach revealed he had held initial discussions with the British & Irish Lions over taking charge of what would be a third tour in South Africa in 2021. Gatland will leave Wales after this year’s World Cup and said: “I have had a couple of discussions with some people at the moment, but there is definitely nothing concrete. “Maybe at the end of the World Cup I’ll be unemployed. I was looking to take a few months off and then start looking again in the middle of 2020 and potentially do some Super Rugby in New Zealand if there was an opportunity. “I thought I’d probably go back there and do that, but I am also aware there are not a lot of jobs in New Zealand. That might not be an option. Ireland visit Cardiff on the final Six Nations weekend in March and Gatland believes his team can cause an upset in what he views as an open championship. This will be Gatland’s 10th tournament with Wales and he said “It’s my last Six Nations – with Wales! It’s a big year for us so you’ve got to be up for that. “What’s changed about the Six Nations is how competitive it has become. “There was a period when everyone said it was between England and France and everyone else just made up the numbers. I was involved in the old Five Nations before Italy and they’re still playing a bit of catch-up, but at the moment I think the other five teams are all capable of beating each other. “I take a lot of pride in the fact we go out there and it doesn’t matter who we play, they know they’re in for one hell of a tough game. “Success for me is not always about winning, it’s about overachieving. If you look at the Premier League and a team like Bournemouth, they’ve been successful because they’re overachieving in terms of what people expect. If Cardiff City stay up this season they will have been successful and overachieved because everyone expects them to get relegated. That’s the way I look at things. Email “Gatland hopes Wales learn from Irish model as he prepares for final Six Nations”. Feedback on “Gatland hopes Wales learn from Irish model as he prepares for final Six Nations”.